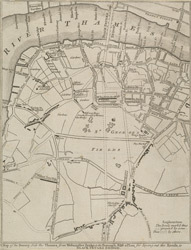 The title of this map of St George's Fields, Southwark, appears below the plan with key at bottom right. Alternative plans for laying out Blackfriars Road are indicated by double-dotted and pecked lines. The mile-long road was finally finished in the last quarter of the 18th century.